It happened in the summer of 2004. 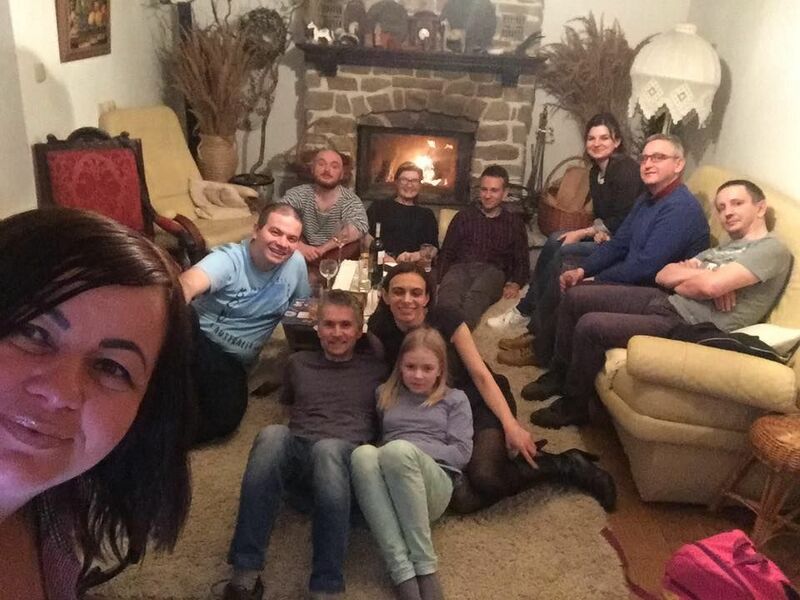 Nancy and her husband James arrived in Kraków and met with Zenon and his cousin Cezary. They headed East of Krakow to the old central Galicia, today’s South-Eastern Poland, Zenon’s homeland. It was the first time for Nancy visiting her grandparents’ places, and it was the first time for Zenon in assisting a grandchild of emigrants on a journey to the land of her ancestors. The first two days were spent following traces of two of Nancy’s grandparents, visiting their home villages more than 100 years after they left them, and discovering, with more or less luck, family history in the old parish books. What happened on the third day was the culmination of the whole adventure. They drove to the third village where Nancy’s father was from. There they met the nicest priest thus far and after more than an hour of digging in the books Cezary suddenly looked up and said, ‘These people could still be living!’. After a few phone calls made by the priest, they arranged to meet with one of the families. This is how Nancy described what happened next, ‘They greeted me warmly and handed me pictures of Dominik and his brother Ambroży. I was shocked, because it was as though I was looking at photos of my own father! (If you want to read the whole story described by Nancy, visit the website ‘The Gift of Family‘. To this day, Nancy remains in touch with the family in Poland). After this emotional and profound experience, the decision was made that we will try to help others discover, understand and feel the same as Nancy and her family in Poland experienced. And Nancy became the ‘matka chrzestna’ (godmother) of this venture. We started with a simple website where we offered our help in Genealogy Tours. Next, there was a second version of the website where we added a Forum, and later Surnames and Places Databases. Month after month, year after year, Forum activity has been growing. People who were just starting their family history adventure have been receiving invaluable support from experienced and so generous in sharing their experience contributors. Very often, these beginners became experts in their field and now they too share their knowledge with others. The number of surnames and places in the Database increases every day. It enables people coming from the same towns and sharing the same surnames to easily connect with each other. The PolishOrigins community is growing strong and our collective wisdom is continuously developing. Our team has been growing, too. To realize even a single day long tour requires a lot of preparation from an organizational and genealogical point of view. That’s why we say that we are in a team sport. We are genealogists, guides, historians, folk dancers and singers, culture and life lovers. What unites us is that we are from here, and we are proud to share our insider’s experience and passion for this land. PolishOrigins brand is a registered tour operator. Our internal systems and processes were tested ‘in the trenches’ hundreds of times and we are continually improving them. Through years of providing genealogy and tourism services we acquired unique skills and developed our own know-how in organizing tailor-made genealogical, historical and cultural tours. You cannot predict everything and you don’t have an impact on all events. But what we can control we try to realize with excellence. This allows our guests to completely focus on experiencing the most important moments during their trip of a lifetime. Since 2004 we have facilitated and witnessed hundreds of stories like the one with Nancy. Some of them are described on the blog by our honorable guests. All of our guests (we don’t remember any exceptions) want to return, and many of them do! Some of them already visited Poland with us 3 times and they are planning their 4th trip. Each and every year there are more and more family stories like these being written. We know this is only the beginning of the journey. There are still hundreds of families waiting to be reconnected, thousands of family histories waiting to be discovered and, maybe even more, new family stories yet to unfold. Future generations, children and grandchildren of our guests are waiting to experience these unforgettable, meaningful moments. This is why we are here: to make all of this happen, to reconnect families, to help you to uncover your roots in old Poland.